SEGA Games starts with the Letter "Q" / Page "1" / SEGA Genesis / Mega Drive games | SSega Play Retro Sega Genesis / Mega drive video games emulated online in your browser. QuackShot: Starring Donald Duck, known in Japan as I Love Donald Duck: Guruzia Ou no Hihou (アイ ラブ ドナルドダック グルジア王の秘宝? ), is a 1991 platforming video game developed by Disney Interactive Studios and published by Sega for the Sega Genesis. The game was released in Europe in 1991, in North America on December 19, 1991 and in Japan on December 20, 1991. It stars Donald Duck and his three nephews, Huey, Dewey, and Louie, as treasure-hunters. Much of the game is patterned after the first three Indiana Jones films. 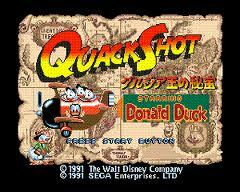 QuackShot is part of a series of games that Sega of Japan produced for the Sega Genesis based on Walt Disney cartoon characters. Its 8-bit counterpart is Lucky Dime Caper, released only for the Sega Master System and Sega Game Gear. The game also was on a cartridge entitled "Disney Collection" bundled with Castle of Illusion. QuackShot was converted for the Sega Saturn and released together with Castle of Illusion only in Japan as part of the Sega Ages series in 1998. It is a straight conversion of the game with no substantial changes. QuackShot was released to mostly positive reviews from video game journalists. The game was universally lauded for its graphics, with magazines like Sega Pro describing them as "some of the best graphics around." The game was also praised for its music and puzzles, as well as their clever use in the game. However, QuackShot was criticized for its controls, being described by IGN as "float-y" and making certain segments of the game unnecessarily difficult. The game was also criticized for its lack of difficulty overall as well as its lack of speech samples, which several other Genesis games of the time had. 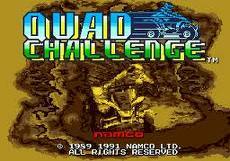 Quad Challenge (メガトラックス, Mega Torakkusu?, MegaTrax) is a racing video game for the Sega Genesis using quads as a racing vehicle.